The leaves of a coriander plant are commonly known as cilantro. Cilantro has been shown to have an antibacterial compound that can help fight food-borne illness, like salmonella. Fresh cilantro has large, flat leaves and looks quite similar to flat-leaf parsley. Cilantro is often found in Thai cuisine, and in Mexican cooking, like salsa, guacamole and meat dishes. If cilantro is used in heated dishes, it’s usually added toward the end of cooking or as a garnish, like in a soup or stir-fry. Orange dots show how 1 ounce of cilantro fits into the typical nutrient profile of a Paleo meal. PURCHASE: Cilantro can be purchased in the produce section throughout the year. Look for cilantro with bright green leaves that are free of yellow or brown spots. The stems should be firm. STORAGE: Have extra cilantro, but don’t want it to wilt and go bad? 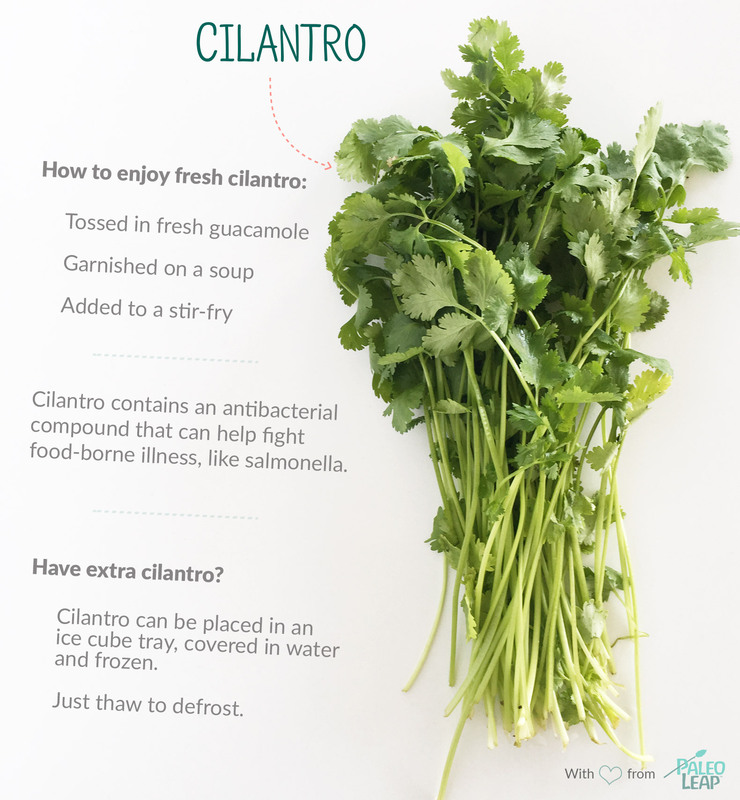 Cilantro can be frozen in an airtight container, or placed in an ice cube tray and covered in water, then tossed in a soup when ready to use. GROW YOUR OWN: Cilantro is easy to grow and a great addition to an herb garden. Organic cilantro bunches are fairly inexpensive to purchase. Add finely chopped cilantro leaves to a fresh batch of guacamole. Enhance the flavor of a soup by garnishing with a handful of chopped cilantro leaves. Cilantro in a green sauce or chimichurri is perfect! Toss chopped cilantro leaves into a stir-fry dish toward the end of cooking.